“Education is a human right,” declared Wikimedia Foundation Executive Director Sue Gardner to an applauding crowd of six hundred last week in the Haifa Auditorium. The audience was gathered for Wikimania 2011, an annual event to celebrate the Foundation’s mission and accomplishments, and to plan its strategy for the coming year. Delegates from every corner of the globe proudly refer to themselves as “Wikimedians,” and unite in a common passion for free information sharing. This year, their supervisors were young tech-savvy Israelis, nervous in their first, and possibly only, opportunity to manage and address a large international crowd. A large percentage of them were wearing skullcaps. It was the sort of sight that one needs to see in order to believe. Haifa, Israel was chosen as the location of Wikimania 2011 with much fanfare and much controversy. Tomer Ashur, chairman of Wikimedia Israel, related that his team reacted with disbelief last year to their successful bid to host the conference. In his address to the gathered Wiki faithful in Haifa on Thursday, tinged with a tone of apprehensive relief, Ashur explained that Wikimedia Israel had to hit the ground running after the decision in order to identify a host city and prepare a venue. Haifa was a natural choice, for three reasons: First, it is a university town, home to the Technion and the University of Haifa, two of Israel’s most prestigious institutions of higher education, and therefore conducive to the educational nature of the conference’s mission. Second, the city features an impressive high-tech industry center, aligning it with the technological savvy of Wikimania’s participants. Finally, Ashur announced to resounding audience approval, the northern coastal city is the greatest Israeli symbol of Jewish-Arab coexistence, with 26,000 Arab residents, 10% of the total population. I had the opportunity to meet and speak with enthusiastic Wikimedians from around the world. Marek Blahus of the Czech Republic writes Wiki pages in Esperanto, and, along with fellow activists at the conference, maintains that Wikimedia should encourage the usage of Esperanto as a universal language, rather than settling on the English standard. 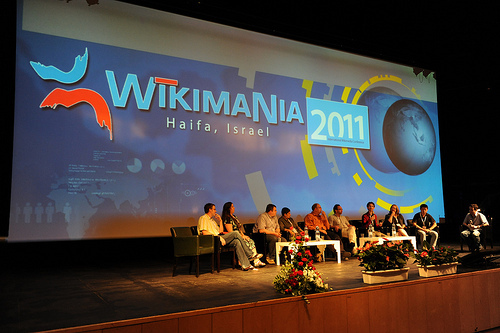 All Wikimania 2011 events were conducted in English or Hebrew, with translation services offered. Ming-li of Shanghai, the only Chinese representative, expressed dismay about his government’s strict control over the exchange of online information. I also encountered groups of students from India and the Philippines, who expressed excitement at the opportunity to visit and experience Israel, albeit for a short time. Their sentiments are not shared by all Wikimedians, however. A significant movement emerged to boycott the event and Wikimedia in protest over Israel’s policies in the West Bank and Gaza Strip. A Facebook page titled “No for holding Wikimania Conference in Israel” has approximately 500 likes, and the absence of these potential participants was felt by those in attendance. The Israeli government nonetheless made good use of the opportunity. The Ministry of Foreign Affairs, one of the conference’s primary sponsors, distributed a free book called “Facts About Israel” to all Wikimedia participants. Haifa Mayor Yona Yahav also included a letter to participants, along with supplementary literature from the Haifa municipality. Even more strikingly, Meir Sheetrit, a member of the Knesset for Kadima, addressed the crowd, declaring his intentions to fight for expanded broadband access across Israel, and for the release of more government information over the internet into the public domain. The Wikimedias responded tot this second announcement with enthusiastic approval, though, contrary to common misconception, the Foundation has no relationship with Wikileaks. The conference participants were also treated to a unique taste of Israeli society, as they unexpectedly found themselves sharing a city block with a full tent village of protesters in downtown Haifa. These protesters, part of a growing movement for social change in Israel, had no official interaction with Wikimania, although their proximity was strongly felt by all, and even received mention in several of the talks. In one of the more poignant moments of the events, Harvard professor Yochai Benkler expressed his view that the protesters outside, the conference participants inside, and the brave rebels just 90 miles northeast in Damascus are all part of the same struggle for freedom and social progressiveness. Quite awesome once again. keep writing!